In order to maintain their excellent reputation for secure software, Alt-N Technologies, developer of Exchange alternative MDaemon Messaging Server, continually perform rigorous testing across their portfolio of products, including both current and historic releases. 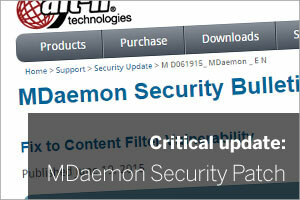 In one of the recent tests a potential vulnerability in the content filter was discovered that could make MDaemon vulnerable to malicious attacks. As always Alt-N Technologies have reacted very quickly indeed, releasing a patch the same day the vulnerability was noticed. So with that in mind, we highly recommend that customers using MDaemon Messaging Server visit the page on Alt-N’s web site where you can download and install the MDaemon Security Patch as quickly as possible. The patch is available to all users of the MDaemon Messaging Server, of course, free of charge, regardless of upgrade protection status. If you’ve got any questions about this update please feel free to get in touch in the usual ways.